Warning: Honey should not be fed to infants under the age of 1 or to people with sever immune system deficiencies. This is due to possibility of botulism spores being present. This level of botulism will have no ill effect on a healthy person. Extracted honey is honey in its standard liquid form. Although this category includes processed honey, raw honey is often the desired product. Raw honey is honey that has been extracted from the honeycomb that has not been possessed in any means, except possibly by simple filtration. Comb honey is capped honey that is still contained within the wax comb created by the bees. It is a traditional favorite eaten wax and all, however it has more recently become difficult to easily find. Before the usage of extraction, nearly all honey came in this form. Chunk honey is a cross between comb honey and extracted honey. Observation shows that it is simply smaller pieces of comb honey suspended in extracted honey. This product is notoriously hard to find in most regions without a local beekeeper. Creamed honey is the generic name for liquid honey which has either has naturally crystallized or induced to crystallize by the addition of dextrose sugar or seed crystals of other crystallized honey. Creamed honey if often used as a spread for toast or bread, the only real difference between it and liquid honey is that it is more so solid and there by less likely to run. A keen eye may also be able to spot various forms of adulterated honey, which often refers to a liquid honey that has had something added to it, most often a flavor, chopped nuts, or dried fruit. While conventionally not a standard form of honey, or even a variety, adulterated honey has become a favorite of some, and is worth mentioning. Honey is a solution composed mainly of sugar and water with a smaller amount of other naturally occurring compounds. The specific composition of particular sample of honey is largely dependent on the nectar source used by the bees that produced it. Consisting of mostly sugars suspended in water, honey has several interesting properties that can be exploited. Honey is highly hygroscopic, meaning that it will pull moisture from the air and other mediums. 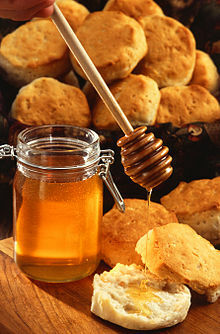 Where as it is not advisable to use honey as a desiccant, many bakers incorporate honey into recipes as to keep baked goods moist. In atmospheres with a relative humidity greater than sixty percent, honey will get to work absorbing moisture from the air. Because the moisture content of quality honey is less than seventeen percent, it will resist fermentation by most yeast. If desired, as it is sometimes, honey can be diluted to create mead, but even then osmophilic yeast must be used for proper success. Some honeys, due to a particular plant protein refined in the nectar of a few plants, show thixotrophic properties. This means that the honey will appear to be in a sold form, akin to creamed honey, but will actually revert to a liquid from when slight agitated. Once the agitation stops it will quickly return to solid. Some honeys that do this include pure grape fruit and pure ling honey. Give enough time and patience, all varieties of honey will eventually granulate. The speed of granulation is largely dependent on the ratio of fructose to glucose within the honey, the more glucose the quicker granulation will take place. Granulation time can also be decreased by heavy agitation, such as whipping or the inclusion of seed crystals. Honey can be returned to liquid form by applying heat, though granulated honey tastes just as good. Honey has been show to have certain antibacterial properties, some honeys such as Manuka honey show an even greater antibacterial strength. Because of this property honey was often spread on wounds, especially burns, to promote healing. Due the antibacterial and anti-fermentation properties of honey it is impervious to spoilage when properly kept. There are about 1380 calories in a pound (12.7 kilojoules per gram) of honey. To make just over 11 pounds (5 kg) of honey requires bees to travel a total distance roughly equal to a round trip from earth to the moon. Canola, Caster and Golden Rod honey will all crystallize within days of extraction. It often takes the equivalent amount of nectar as to make between 7 and 9 pounds of honey, to create one pound of beeswax, or between 7 and 9 kilogramss of honey, to create one kilogram of beeswax.